Dippity pig syndrome, also often used interchangeably with "Erythema Multiforme" or bleeding back, is thought to be a neurological disorder, but, not all pigs get it. Dippity is probably the most frightening thing most pig owners ever see. Its often prevalent in the spring time, but can be seen any time of the year. Dippity can be exacerbated by the sun/sunburn, stress, such as a violent thunderstorm, a trip to the vet, deviating from the normal routine or other things like moving furniture, having guests over, etc. It is not clear whether the stress is internal or external or whether it can be self-induced. Examples of external stress could be a sudden deviation in normal routine or excessive sunlight, internal stress could include dehydration or drastic changes in body temperature due to climate or other illness. There really is no specific treatment, but rather pain control and no preventative treatment either. (However, if sunburn or excessive sun is the trigger, using sunscreen can help lessen the chances of your pig getting dippity pig syndrome) Most often, the pigs affected are under 2 years old although there have been reports of pigs older than 2 years old getting it too. This illness appears suddenly and most times an area of "weeping" blister like sores are seen (usually the actual moisture is what is seen, it resembles a wet spot on the side or back), typically these lesions run side to side, not head to tail usually starting near the run and move towards the head and these lesions can form in a matter of minutes. 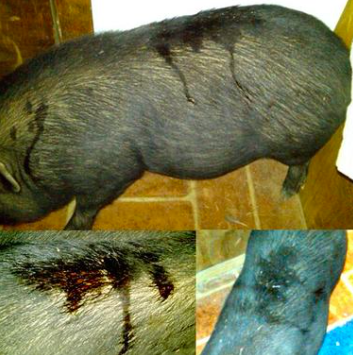 A young or baby pig who was fine last night gets up this morning with long “gashes” across his back and when he tries to walk his hindquarters just seem made of rubber and he almost falls, “dipping” down to the floor with his belly. He hurts and cries out if you touch him and the gashes ooze a reddish fluid of thinly diluted blood (serum). The overall symptoms vary from pig to pig, some have all the classic signs, some only have one or two. Some of the symptoms include: a sensitivity to being touched around the back end of the pig sometimes to the point that the pig squeals when touched a “hunkered-down” stance with the tail tucked between the back legs and clamped to the body weakness of and/or inability to use the back legs to the point of falling down pain, restlessness, and distress. This condition is very painful for pigs and because they often "dip" down when you pet the back the unofficial name given to this disorder has been dippity pig syndrome. The onset is very sudden and leaves just as mysteriously/abrupt. typical timeframe is 48-72 hours. It is both scary and heartbreaking to see a pig with dippity, and once a pig gets it, they are prone to get it again. (the video below shows a pig with dippity pig syndrome) Sometimes people think their pig was the victim of a predator attack, while sometimes this may be the case, usually, it is a case of dippity pig syndrome. All other diseases need to be ruled out, because there are some that resemble the symptoms of dippity, so look for the weeping areas on the back and sudden onset along with the "dipping" when you touch the back to point towards a positive case of dippity pig syndrome. Assuming there has been no recent surgeries, enteric coated baby aspirin (5mg per lb of body weight, this comes in 81mg/baby aspirin and 325mg full strength) or children's Tylenol, 5mg per pound (160mg per 5ml is the usual concentration, the actual dose is 1ml per 6 lbs of pig) either one can be given every 8 hours as needed for pain for 3 days with food. Do NOT give both medications at the same time, you can choose one or the other. You can also give Benadryl to help them rest, that dose is 1mg per lb (the normal pill comes in 25mg tabs). The most important thing you can do for your piggies if dippity strikes, is to immediately reduce stress, both internal and external. You can help control the symptoms by placing the pig in a dark quiet room set to an appropriate temperature for that time of the year. A dark, quiet area does a lot to soothe and calm a pig, You can also play soft music as this has been proven to help calm a stressed pig as well. Keep your pig hydrated during this time, and reassure and comfort your pig often. We know these things help. Because of the short life of the disease and the fact that it goes away on its own without any intervention, there hasn't been a lot of research done to determine if there is any kind of treatment that truly helps. What we do know is that this illness is painful, and this is why pain meds are recommended, but again, please don't medicate your pig unless you've cleared it with your vet. Some will also use cream on the affected areas, if lesions are present, liquid vitamin E or aloe vera gel are soothing and healing. Some vets prescribe topical 1% hydrocortisone cream. Consult your veterinarian as to the appropriateness of drugs to alleviate discomfort or pain. If you're not seeing any weeping sores (and not all present with the same symptoms) and there is no "dipping", it's likely not dippity, especially if your piggy isn't having any difficulty walking/standing either. These symptoms are what helps to draw the conclusion that it's dippity. Dippity is usually pretty easy to spot, other diseases aren't, so if you're not sure that your pig has dippity pig syndrome, call your vet. If you don't see any of these symptoms or only one, I personally, would call a vet. Does your pig have a temperature? Eating, drinking, peeing and pooping ok? What are the symptoms your pig is having? Any behavioral changes? Lethargic? Answering those questions would better help in finding out possible problems with your pig. Pigs can have various injuries resembling dippity pig syndrome and although dippity isn't life threatening, some of the other possibilities can be….